A report that focuses on the complexity of recovery plans. Even though recovery planning is not a new topic, it still remains a key concern for the banking industry as well as for supervisors and regulators. While banks are not obliged to produce playbooks and perform dry-runs, their use on a case-by-case basis is advisable. On 3 July 2018, the European Central Bank (ECB) published a report presenting the findings of a comprehensive benchmarking analysis of recovery plans of Signifcant Institutions (SIs) for the three previous cycles of recovery plan assessments. The report focuses on the complexity of recovery plans from a multitude of banks that could face diffculty when under pressure in a stress situation. According to the ECB, the complexity and length of the plans is likely to inhibit the ability of the banks to implement recovery plans quickly and effectively. As a result, the ECB has concluded that the usability of complex recovery plans should be improved and emphasise the effectiveness of developing so-called ‘playbooks’ and performing ‘dry-runs’ to ensure that banks are able to make the right decisions in crisis situations. 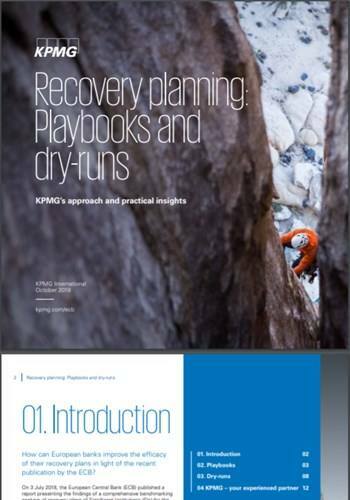 KPMG member frms’ experience helps us in supporting European banking clients develop effective recovery plan playbooks, practical dry-runs and to ensure regulatory compliance.